Comics writer Dan Abnett has been having great fun with a series of video question and answer sessions compiled by Adelie High. This one, titles "From Ghostbusters to Triumff" - there are several which include questions about his work on Warhammer and more - includes Dan's recollections of his first comics work at Marvel UK. He also has great fun describing the layout of his secret headquarters as he answers questions from just some of his many fans, and outlines his latest projects including Triumff and Embedded. Recommended viewing! Today's podcast from Ian Cullen's cult web site SciFiPulse.net features an exclusive interview with comic writer Tony Lee, who talks about his career and his latest graphic novel, Bram Stoker’s Dracula: Harker, which is being published by Markosia. The book features art by Peter-Davis Douglas and Neil Antwerpen. “Last year, I was speaking with [Markosia publisher] Harry Markos, a small press British company that I've been involved with since the very early days," he explains. "They were one of the companies that did Starship Troopers and took on [my book] Hope Falls. I've done other bits and pieces for them over the years, and we were discussing doing something different. Pullman, Rowling part of books "Influential Elite"
The DFC comic writer and award-winning author Philip Pullman and fantasy author JK Rowling, creator of Harry Potter, have been listed as two of the UK book trade's elite, in a definitive list published by The Bookseller magazine. 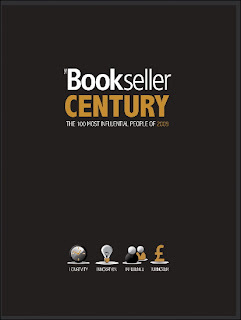 Called The Bookseller Century, the list, available to read online as well as in print, recognises the UK's 100 most influential people in 2009, including publishers, booksellers, agents, journalists, bloggers and authors. Overall, the list features 15 booksellers, 34 publishers and seven agents. Pullman, a huge comics fan, revealed earlier this year that he planned to revive his character, John Blake, who featured in The DFC which sadly has fell victim, like many other things, to the current financial situation. 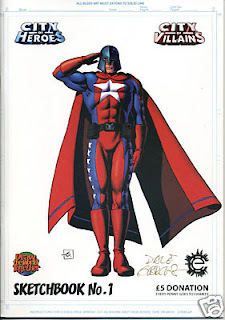 "Everyone connected with the comic hopes that The DFC will rise again one day, and so do thousands of readers," he noted on his official web site, "but the story of John Blake must be told. So I’m going to write it as a film and as a graphic novel." "This is a significant and long overdue moment for us and for the trade, a rigorous and thought-provoking selection of the decision-makers and innovators that make the book trade tick," argues Bookseller's editor-in-chief Neill Denny. 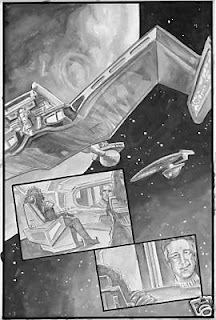 One of my 'day' jobs is reviewing Star Trek comics for Titan's Star Trek Magazine - and I was recently thrilled to see US artist JK Woodward's work grace the latest IDW-published Star Trek: Klingons title. I first came across his stunning art via the independent title Crazy Mary, written by Michael Colbert, which I adapted for mobile and is distributed on ROK Comics: but most people reading this will be more familiar with his work on X-Men and other US titles. Anyway, if you enjoy his work as much as me, there's now a chance to owning a piece of very cool Star Trek art from the new book. Michael Colbert's wife - who sadly lost her grandmother to cancer very recently - is involved with the American Cancer Society's ”Relay for Life” project, dedicated to raising money for cancer research. JK has donated an original page from the Klingons book for auction on E-Bay. "This thing has Klingon war ships, the Enterprise B, Kang and all done by JK’s brilliant hand," Michael enthuses. "The page will be signed by JK and every dime will go to the charity goal." "This is a win win for everybody and it would be great if folk bid on it." While we're mainly about British comics here on downthetubes I'm more than happy to help a friend promote and support a very good cause. • The e-bay link is: ebay KLINGONS! Comic creator and Temple APA member Paul Eldridge has recently compiled a collection of the strips that he originally created on mobile comic creation service ROK Comics. 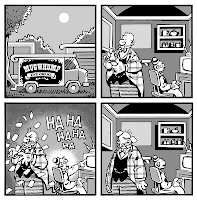 Tales from my Mindverse contains strips created using the ROK Comics creator tool is introduced by the service's former editor. The collection includes strips which gained Paul high acclaim in competitions on the platform. You can download a PDF or CBR/CBZ from the following places, or view it on myebook.com. Sherlock Holmes Battles Mr. Hyde! No, this item is a plug for Strip! 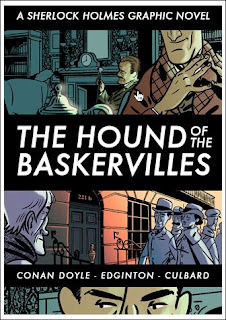 : Sherlock Holmes vs. Dr. Jekyll & Mr. Hyde, the latest radio show from Alex Fitch on ResonanceFM, talking to the illustrators of some new and recent literary adaptations in comic book format. Self Made Hero is a relatively new publishing company who have made a name for themselves with their range of Manga Shakespeare adaptations and are now doing European style graphic novels of literary classics. Alex talks to Ian Culbard, artist of Ian Edginton's adaptations of the Sherlock Holmes stories The Picture of Dorian Grey and The Hound of the Baskervilles and to Andrzej Klimowski and Danusia Schejbal, illustrators and adaptors of The Master and Margarita and Dr. Jekyll and Mr. Hyde. • ComicBitsOnline is wondering why Britain's biggest comic publisher has not been nominated for an Eagle Award -- and it's not DC Thomson, Panini or Titan but Cinebooks Ltd., which now publishes some 40 top quality comic albums a year and exports them globally. Why is it not getting attention? 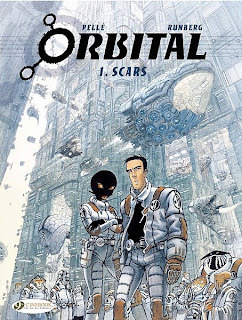 Because its titles are English editions of European titles such as Lucky Luke, Blake and Mortimer, Orbital and The Scorpion - superb comics that have had little exposure because they were originally created in a language other than English. "Cinebook - The 9th Art is like a fresh breath of air in a stale market," argues CBO author Terry Hooper, "and it’s about time that a “Comic Industry” award realised that they must - must - begin to recognise the company for its publications as well as its commercial value. "If it doesn’t then it just proves what people have been saying for years; awards are given to mates, mates of mates or given through influence because no one wants to upset Marvel or DC." • The Forbidden Planet International blog reports Ilya and Emma Vieceli will be at the London Cartoon Museum (35 Little Russell Street) on 30th May to celebrate their work in Self Made Heroes’ well received Manga Shakespeare graphic novels, with exhibits, talks and a slideshow presentation. The event starts at 1.30 and runs until 4.00pm. • If you are in London and looking for something to divert the kids over the half term or the summer holidays there are a number of activities on the London Cartoon Museum’s events list, from Never Mind the Beano on Wednesday 27th May (learn to draw your own Beano characters) to summer classes in comics drawing and even in clay animation. • Artist Nelson Evergreen reports he recently created a comic to promote Doublesix Games' comedic PS3 slaughterfest Burn Zombie Burn has been included in an exhibition of videogame inspired art running this weekend at the Brighton Fishing Museum, as part of the Brighton Festival. Opening on Saturday (23rd May), the annex of the Museum will be taken over by a multimedia exhibition of art from, and inspired by, videogames. Award-winning videogames artists will exhibit alongside artists who’s creations are inspired in someway by the world’s largest entertainment industry: videogames. • Writer Lee Robson has posted a fascinating article titled Writer's Block, admitting that is a little misleading but is a great piece on how easy it is to get, well, distracted by day to day happenings when you're a creator. As for writer's block he opines " I don't believe in the concept... I think it was Warren Ellis who said (and I'm probably misquoting here) that if you want to write for a living, you have to get up every day and actually f****** write, and that's a philosophy that I wholeheartedly subscribe to. Or at least, I'd like to." • At the last minute DFC top talent James Turner (creator of the wonderful Beaver and Steve) have got a table at the MCM Expo in London this weekend, so if you are going along keep an eye out for him! He'll be printing some more mini comics (with four pages of all-new B&S material!) and have some new badges to sell too. • Ace cartoonist Roger Langridge has published a teaser image from an upcoming Mugwhump story for something called the Act-i-Vate Primer, which is pretty much what the title says it is - a print introduction to the work of various Act-i-Vate cartoonists. "One for the Mugwhump fans who might be getting itchy during the hiatus," he says. "My story consists of six densely-packed (12-panel) pages showing events before the current strip began. Roger is busy drawing The Muppet Show comic for Boom! Studios and also reports issues - not licensed for sale in the UK - are selling for ridiculous amounts on the InterWeb. "Wait for the book collection, folks!" he notes. "The whole collectors' market is a cesspool of poisonous idiocy..."
Let's hope Titan Books or another UK publisher picks up the rights to that so we can finally read the book in the UK, eh? • The first issue of Stuart Kolakovic 's Nobrow is out! Printed in two spot colours on heavy paper in an oversized format, Issue 1 from this highly talented creator is available in a numbered edition of only 3000 and available from all sorts of arty outlets, as well as from Nobrow.net. • And finally... congratulations to ace blog Thrillpowered Thursday, best described as an issue-by-issue review site for 2000AD, which recently celebrated its hundredth post. For the first time ever, a selection of Alan Moore’s earliest comic-strip creations Future Shocks from 2000AD are now available globally via the Apple iTunes App Store. Alan cut his teeth writing comics for Marvel UK and on this series of ambitious and innovative short stories, and they've now been re-worked by digital comics publisher Clickwheel.net and will be available in eight parts over eight weeks. The aim of the adaptation, says Clickwheel, is to bring Alan Moore’s Future Shocks to thousands of comic fans who have never had access to these stories before. Available now, each episode is priced at $0.99/£0.59. “We’ve been waiting a long time to get our hands on this material," says Tim Demeter, Clickwheel’s Editor, "and as a comic fan myself, I can confidently say that if Alan Moore is one of your favourite creators, you need this!" Quite what Alan Moore may make of this, we're unsure: there has been many a dispute between early writers on 2000AD and publishers Rebellion over reprint rights on paper, let alone iPod -- behind the scenes, Rebellion has been engaged in laying claim to all rights over material published in early issues of the comic that creators laid some ownership to for a while now to make the most of its assets. Some creators have point blank refused to sign away rights, which is why some 2000AD strips remain unreprinted. One thing I missed about not getting to this year's Bristol Comic Expo was the chance to catch up with writer Roger Gibson and artist Vincent Danks, the team from York-based Ariel Press, who always have a gem of a title on offer at the event. 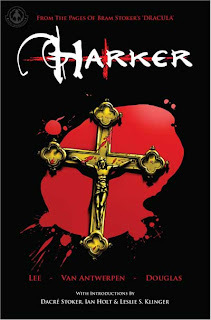 Launched in March, Harker is a gritty new British police comic from Ariel Press, written by Roger (Gravestown, The Bishop, Mad Girl) with art by Vince (Sapphire, Doctor Who). Detective Chief Inspector Harker and Detective Sergeant Critchley are an eccentric pair of cops specialising in serial murder cases: the comic mixes up the best of British police dramas (Inspector Frost, Morse and others) with classic US dramas (Columbo, for example), the Harker series brings you monthly thrills and action, with superb art and witty, incisive scripts. Book One: The Key of Solomon, beautifully renedered in a realistic style Vince has mastered over many years of hard work and fine tuning of his skills, features Harker and Critchley on the trail of ritualistic satanic murders - a complex web of lies, deceit and ghoulish horror, taking place in a Secret London of catacombs, blood soaked churches and Satanic Lodges. The characters are great and every inch the British copper: Detective Chief Inspector Harker is in his late fifties, a copper set in his ways: old fashioned and irritable, eccentric and grumpy, socially inept, a loner, very much an outsider in today’s modern police force. But he’s still a superb detective, accustomed to cutting away the red herrings and getting right to the heart of a case. Detective Sergeant Critchley is Harker’s faithful partner, a 21st Century copper, tooled up with all the latest gizmos and a hit with the birds - and very much the yin to Harker’s yang. Ariel Press was originally created in the early 1990s by Vince, who I first met, and commissioned, back when I was editing Doctor Who Magazine. He set up the company specifically to publish his espionage thriller Sapphire. Roger Gibson soon joined in the fun, Vince publishing the Gravestown comic that he put together with Mark Wayne Barrett. After this initial flurry failed to set the world alight, Vince and Roger returned under the Ariel Press banner with their Raven anthology, containing Vince's continuation of Sapphire, (still available in three collected editions) along with Roger and Mark's Dan Druff, and Roger's The Bishop, Mad Girl and Griffin. All six issues of the first series Harker will be available to buy from the Ariel Press shop or to download as high resolution PDFs directly from the site's download section. They’ll be released monthly, with issue one, two and three already available to buy, and subsequent issues available on the first of every month. Making full use of the web as a promotional tool, the Ariel Press team also offer free weekly downloads, podcasts, videos, sketches and more for fans of the series. 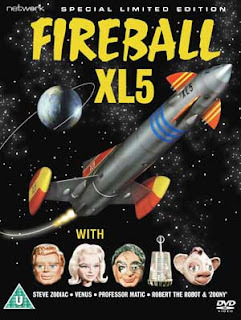 (Updated 22/5/09): Network DVD has announced a "Special Edition" release of one of Gerry Anderson’s most cherished fantasy series, Fireball XL5, next month - and released a clip from a colourized episode. Available from 29th June 2009 this six-set - wrapped in a cover inspired by one of the series original annuals but spruced up with a CGI-enhanced Fireball XL5 -- includes all 39 episodes from the iconic 1960s series, complete and uncut, plus exclusive extras including a 60-page book by top British TV archivist Andrew Pixley. Also included is Drawn in Supermarionation, a new, exclusive documentary chronicling the comic strip adaptations of the early AP Films series in TV Comic and TV Century 21, and features contributions from director of merchandising Keith Shackleton and artists Bill Mevin, Mike Noble and Colin Page. Although the show was filmed in black and white, also in the set is A Day in the Life of a Space General, a brand new, colourised edition of Fireball XL5, taken from a new HD transfer of the original film elements. The show is set between 2062 – 2063, the peace of the universe maintained by World Space Patrol’s finest rocket ship, the eponymous Fireball XL5. A brave, gallant crew led by the heroic Colonel Steve Zodiac - surely inspired by 1950s comic characters such as Dan Dare - explore various exotic planets and other life forms and protect the innocent from sinister intergalactic villains such as Mr. and Mrs. Space Spy. The memorable crew comprises of the glamorous doctor Venus, middle-aged navigator and engineer Professor Matthew Matic and Zodiac’s co-pilot Robert the Robot, who was voiced by series creator Gerry Anderson himself. This series harks back to a more innocent and naive age of space adventure: the series producers for example did away with the need of spacesuits by having the crew swallow 'oxygen pills' to move about their spacecraft. But it's still something of a classic and this edition looks pretty impressive! If you’re 16 plus, with a passion for comic art and live in the West Midlands, then Hi8us Midlands’ latest free comic art scheme, called Comix, could be for you. Applications for the competitive scheme, are now being accepted for consideration. All the lucky winners will get to work with people on similar schemes across Europe and get a supported trip to a comic art festival in Spain and the Birmingham’s International Comics Show. 20 talented individuals will get the opportunity to develop their skills with John McCrea (X-Men, Spider-Man and The Hulk), Hunt Emerson (The Beano, Fortean Times), Laura Howell (The Beano, The DFC), IMAF winner for Best New Manga Asia Alfasi and Andi Watson (Geisha, Buffy the Vampire Slayer) amongst others. Comix is a competitive scheme with only 20 places available for anyone 16+ who lives in the West Midlands and welcomes applications from all groups. (Women are particularly encouraged as they're still under-represented in the comics industry). If you're interested in submitting, applicants don't need any previous qualifications -- just passion, talent/potential and commitment to work hard! To submit for the chance to participate, send Hi8us examples of your best and most recent work. They're looking for good photocopies of two to four pages of pencilled, original continuous comic-strip preferably without lettering (they don’t want pictures of single characters standing around). In other words, they want you to illustrate a comic story without drawing the words or speech bubbles (if you’ve already put text on your artwork they will however accept it). The most improtant thing about your subission is to show how you draw and also how you tell a story in pictures. • At the latest, submissions must reach Hi8us by 6.00pm on Monday 1st June 2009. • An informal recruitment session will take place on Tuesday 26th May, offering an introduction to the scheme and opportunity to meet the lead artists, John McCrea and Hunt Emerson. Hi8us strongly recommend anyone wishing to apply to bring their submission artwork and application form to the recruitment session or, at the very least, examples of work. Contact Hi8us via email (kulwant@hi8us.co.uk) or telephone (0121 753 7700) as soon as possible to book your place at the Recruitment Session. • After all the talk over the last four months about the new set of Ramsey's Raiders stories in Commando, the current batch of issues on sale includes the latest in another long-running Commando series: the H-Boat stories, written by Alan Hebden and illustrated by John Ridgway. These are set during the Second World War and involve military hydrofoils operated by Britain and Germany - boats which rise out of the water on aircraft-like wings attached under their hulls allowing them to travel much faster than normal. In reality, while hydrofoils are a practical design, military applications were only investigated during the Cold War which, technically, makes Commando's tales retro-history science-fiction. 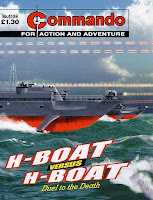 The latest is H-Boat Versus H-Boat: Duel To The Death, Commando issue 4196. 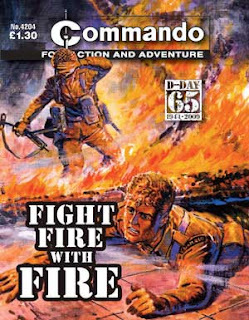 • Following on from our recent item about British comics that have run for the longest amount of time versus the longest number of issues, the next batch of four Commandos, which are out next week, will include issue 4200. Assuming that the Beano continues to be published at one issue a week, it will take until the year 2023 for it to reach issue 4200. 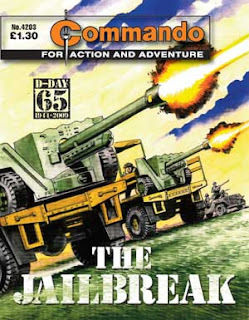 Of course, if Commando continues at its current eight issues a month until 2023 it will have reached issue 5500! • Returning to 2009 and this year is the 65th anniversary of D-Day, the Allied landings in Normandy that was the beginning of the end of the war against Germany. 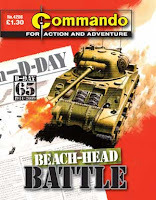 The current Commando reprint book, D-Day Fight Or Die! published by Carlton, is now available and reprints 12 Commando stories set during D-Day, 6 June 1944. These reprints cover a wide range of years from Big Joe, Issue 92, published in November 1963 to Normandy Drop, Issue 4011, published in June 2007. The cover, by Ian Kennedy, has been modified somewhat from its original appearance as a Commando cover by the addition of landing craft. 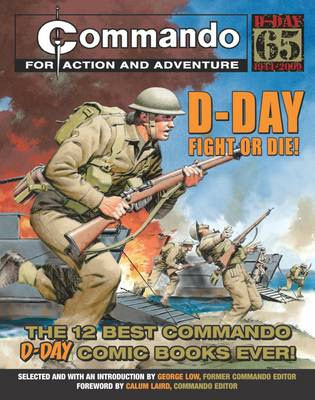 • As well as the reprint book, as we reported yesterday, all eight Commando issues published in June will feature D-Day stories and as usual four issues will be new stories while four will be reprints. Included in the reprints is D-Day Plus, Issue 4205, which reprints issue 187 originally published in November 1965. 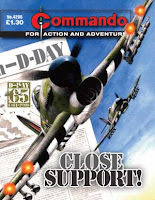 This one is notable as it features a colour cover by artist Mike Dorey which is not from the story's original 1965 publication but from its 1994 reprint marking the 50th anniversary of D-Day. Mike Dorey is better known for his work on Invasion and Rogue Trooper in 2000AD, Iron Annie and Sgt Rayker in Warlord and Computer Warrior and Ultimate Warrior in new Eagle. Dorey's cover is also being used for the D-Day 65 Commando advert. Draw the World Together, an organisation created to unite arts communities in providing possibilities for children who live in communities where they do not have the opportunity for basic healthcare and education, is auctioning a limited edition City of Heroes sketchbook on eBay to raise funds. This latest item - #4 of 10 - is again signed by several artists: Dave Gibbons (who provided the cover), Doug Braithwaite, Misako Rocks, Mark Buckingham, Andie Tong, Phil Winslade, Jon Haward, Mike Collins, Bryan Talbot, Simon Williams, Andrew Wildman, Neil Edwards, Al (Astral Gypsy) Davidson and Boo Cook. If you don't want to make a bid yourselves you can help out by posting a link to the auction on any forums or blogs that you are active in. Marvel has cancelled Captain Britain and MI:13 with #15, writer Paul Cornell reports. 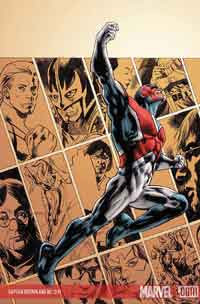 "As you may have noticed, there’s no solicitation today for #16 of Captain Britain and MI-13," he notes on his blog. "That, unfortunately, is because #15 is the last issue." There had previously been unfounded rumours of the book's cancellation, but with estimated sales of just over 17,700 for #11 (see icv2), the well-received title may have been gaining deserved critical acclaim but not the sales needed to keep it afloat. Thanking fans of the book and its various creative art teams, especially Leonard Kirk, Paul held out the hope that it’s entirely possible his working relationship with him was not over, indicating Marvel still had scripting work for him in the pipeline. "One of the lovely things about this book is watching everyone step up, from colourists like Eager Beaver Brian Reber and Canny Christina Strain to our many talented inkers and letterers," Paul enthuses. "Maybe it’s the effort it takes to make the British visuals work that does it. It’s been a delight to see so many people taking their work so seriously." Paul also insists that the book coming to an end now isn’t a revelation that earlier rumours the book had been cancelled were "true all along. "If it had been true then, I’d have told you then," he says. "I think that controversy, and the extremely welcome reaction from fans, ended up doing a lot of good." The good news is, there may yet be more Captain Britain from Paul, who says he has enjoyed writing a monthly comic more than almost anything else he's done as a writer. "While we didn’t know this would be the last arc until comparatively recently, I had it in mind that it was possible it would be from the time I started plotting it," he reveals. "Indeed, the end of this arc marks the end of what I had planned for the book when I started. One of the images right at the finish is what I always felt I was heading towards, and I’m very pleased I got there. "So: you will get a real, thorough, proper, ending, not just of [storyline] ‘Vampire State’, but of the whole run. It hasn’t been rushed to fit the space, it hasn’t been compromised, it won’t just suddenly cut off: it’s what I intended. I think the Annual and the two remaining issues finish off one of my best stories in any media, and that story is actually the entirety of Captain Britain and MI-13... This is a comic with a proper ending." Thinking of hitting the beach this summer? Why not go Commando? 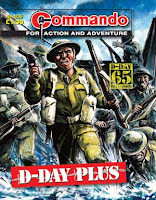 Nearly 50 years after it first invaded British news-stands, DC Thomson's pocket digest title Commando celebrates the 65th anniversary of the D-Day landings in June 2009 with the publication of eight action-packed stories that take readers straight into the heart of the battle. Offering "thrilling stories of heroism on land, sea and air," including Fight Fire With Fire, Terror On The Battlefield and D-Day Plus, the issues follow the fortunes of ordinary Allied soldiers as they bravely take to the Normandy beaches and fight to defeat their German foes. “D-Day was without doubt the most important 24 hours in the history of the Western World,” explains Commando editor, Calum Laird. Launched by Dundee-based publisher DC Thomson & Co Ltd in June 1961, Commando's very first issue was Walk – Or Die!, illustrated by Amador Garcia. It sported the first of many garish, exciting covers by artist Ken Barr, one amongst many early artists who set the visual tone for the ensuing five decades of comic strips, many with hard-hitting titles like Blood River and Cold Steel. These pocket-sized books − their dynamic covers adorned with an iconic dagger logo – were filled with tales of wartime valour, honour, treachery and revenge. In their heyday, Commando was a publishing phenomenon. Circulation figures were huge: peaking at an amazing 750,000 copies one month during the 1970s. To begin with, Commando almost always carried stories about the Second World War. Now, though, the reader can expect tales from almost any conflict, from Roman times to the first Gulf War. 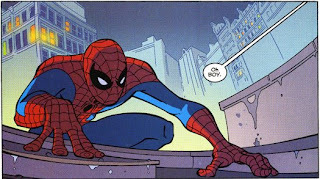 As long as there is an exciting action yarn with a morally-minded hero at its core, any time period will be considered. In the age of Blu-Ray, Playstation and iPod, Commando survives, stubbornly refusing to surrender in the dwindling comics market place. Calum Laird also notes that this much-loved, comic institution has avid readers amongst members of the Armed Forces. Apparently, they are the ideal size for combat trouser pockets. In 2005, Carlton Books released The Dirty Dozen: The 12 Best Commando Books Ever!. This large format compilation book was a big hit, and more followed. The seventh volume, Fight Or Die!, a hand-picked collection of classic D-Day tales is due out very soon. “Commando may have been at the heart of many a battle for 48 years, a veteran by anyone's standards, but it's not ready to throw in the towel just yet,” concludes Laird. 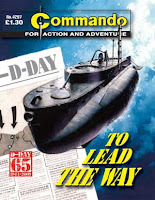 • Commando’s D-Day stories are Issues 4203-4206, published on 11th June − followed by Issues 4207-4210, out on 25th June 25. 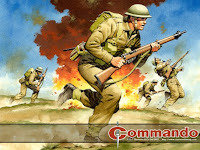 Visit www.commandomag.com for features, cover galleries, wallpapers, exclusive merchandise and subscription information. Is The Dandy the World's Oldest Comic? Mooching through some piles of old comics over the weekend, one of our readers noticed a 2007 issue of The Dandy (Issue 3007) proudly proclaimed the title was now a "record breaking longest running comic ever!" Thanks to The Dandy's frequency change to a fortnightly title in recent years, in terms of number of issues The Beano has now claimed that title - and of course Commando, with eight issues a month, also beats its 2007 record. 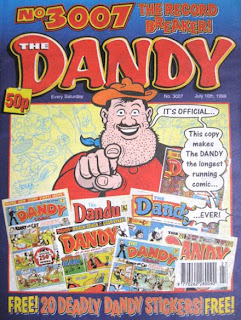 But The Dandy remains the UK's oldest comic... but is it also the world's oldest comic? Surprisingly, in the UK, if you asked anyone what the most famous long-running UK comic was (even if they're not collectors) then the answer would most likely be The Beano. It's a question that's fooled many a TV quiz entrant down the years. In fact, it's DC Thomson's The Dandy (originally named The Dandy Comic, until June 1950), its first issue date 4th December 1937. Commando, The Beano and The Dandy's have long beaten the previous "most issues" record holder, which was Comic Cuts, a title that ran for 3006 weekly issues, from 17th May 1890 until 12th September 1953. The Dandy is now at Number 3471, The Beano, still weekly, at Number 3483 - and Commando, first published in 1963, this month hit issue 4198 with Brotherhood Of Evil. But what about age? Comic Cuts ran for 63 years and four months old before it merged with fellow Amalgamated Press title Knockout, itself merged with Valiant in 1963. In comparison, as well as running for more issues, The Dandy is now well into senior citizenship at 71 years, four years and two weeks old. 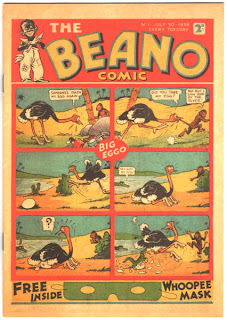 While it may have more issues under its belt the weekly Beano, its first issue dated 30th July 1938, is younger -- currently 70 years, nine months and two weeks old. However, in terms of sheer longevity, these two stalwart British comic titles are still younger than the longest running comic in the US: DC Comics Detective Comics first monthly issue is dated March 1937, making its current age 72 years and two months, while its nearest US rival is Action Comics, its first monthly issue dated June 1938 (and currently 70 years 11 months old). Timewise then, Detective Comics is the longest running comic in the western world that we know of. But issue wise, with UK comics traditionally being weekly, The Beano holds the crown. So The Dandy is the world's oldest longest-running comic? Well, we're pretty sure that The Adventures of Obadiah Oldbuck, originally published in several languages in Europe in 1837, is no no longer in circulation, or Japan's Shiji no yukikai, first published in 1798. Britain's Boy's Own Paper, first published in 1891, is long gone, as is Australia's The Kookaburra, first published in 1931. While the UK has beaten the US in terms of volume of issues, when it comes to first issue values those DC Comics still hold sway. UK comics generally aren't considered that collectable in the US, so prices of early Dandys and Beanos are a lot less than their respective US 'counterparts'. There are estimated to be only some 30 to 40 extant copies of each of these title's first issues in existence, so they don't come up for auction very often. A copy of The Beano Number 1 sold for £12,100 in 2004, and a copy of The Dandy #1 - complete with free gift - sold for £20,350. 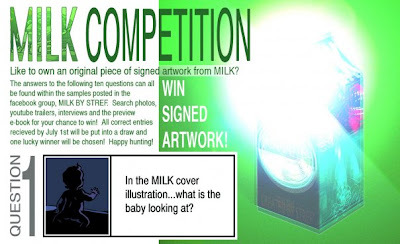 Stephen 'Stref' White, creator of the upcoming graphic novel Milk is offering his fans the chance to own an original piece of signed artwork from the book. Join the Milk fan group on Facebook then follow the links there to answer the ten questions (all the answers can be found within the samples posted on the Milk group page on Facebook). The competition is open until 1st July 2009, when all the correct entries will be put into a draw, with one lucky winner will be chosen. Milk is Stephen's first published graphic novel and will soon be available from Insomnia Publications. Highly praised by comics writer Alan Grant, it's a collection of short stories, but unlike most anthology strip titles they're all the work of one man - 'Stref', each piece is masterfully executed in a completely different style. The book will be about 100 pages long, and consists of at least 14 short stories, a gallery of artwork, and plenty of "back matter" covering Stref's extraordinary style, the history of the project, and his creative techniques and inspirations. "Milk contains as many styles of storytelling as it does styles of artwork," Stephen revealed in an interview for online popular culture 'zine RKYV last year (Issue 18 - PDF version). "Some stories are simple and straight forward, while others are more cryptic and metaphorical. writing. Often I am left with a picture that I myself do not understand and only after a bit of time can I look back at these pictures and figure them out. I have had something on my mind that needed out, it’s kind of like a process of cleaning out my brain!" 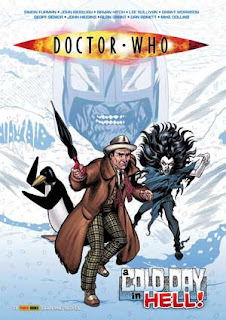 As previously noted, Panini UK has just released Cold Day in Hell, its first collection of Doctor Who strips featuring the Seventh Doctor, played on TV by Sylvester McCoy, in May 2009.
downthetubes has now published an in-depth 'strip by strip' feature based on interviews with most of the strip creators - including Lee Sullivan, John Ridgway, Mike Collins, David Hine and Alan Grant - who worked on the stories featured. The feature is an extended version of material provided fora back up article published in the collection, and includes comments from writer Simon Furman, who was unable to contribute to the print edition version due to time contsraints. It also includes material cut for space reason but does not include interview material with the strips' editor, Richard Starkings -- you'll have to buy the book for that!